Sedum adolphi, commonly known as Golden Sedum, is an incredibly versatile rangy color accent in succulent landscapes, borders and along pathways or for spilling forth out of planters. Star-shaped, white flowers add winsome contrast to the greenish-yellow leaf color, which sparkles golden orange in strong light. It is a bushy plant in bright light. In shade, stems tend to trail. White flowers are borne on leafy stalks at the stem tips. 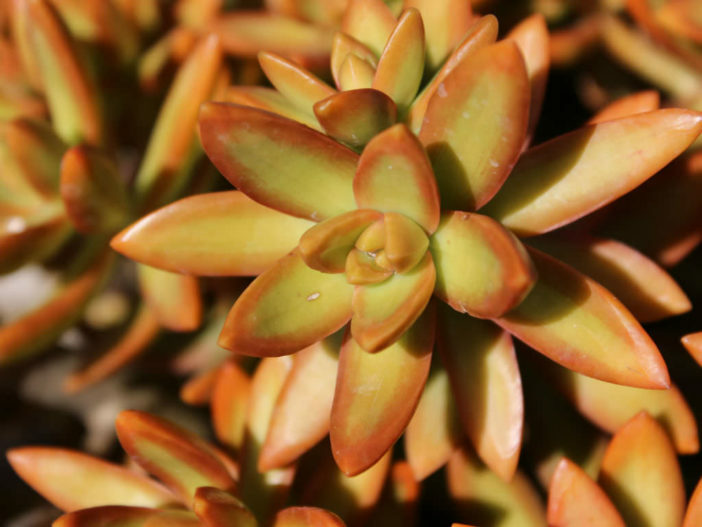 Sedum nussbaumerianum is similar but oranger in color when grown in the sun and its stems are less upright. Some botanists believe that the two should be lumped under the name Sedum adolphii. Water as often as needed. Golden Sedum is drought tolerant once it establish a deep root system. It’s best to use the “soak and dry” method, and allow the soil to dry out completely between waterings. Fertilize annually with a balanced fertilizer. Apply the fertilizer to the soil in the spring as new growth appears, according to package directions. Trim back with a string trimmer to remove flowers if the plant starts to look untidy. Divide Golden Sedum every 4 years to encourage new growth. There are 3 ways to effectively propagate Golden Sedum: from seed, leaf cuttings and stem cuttings.